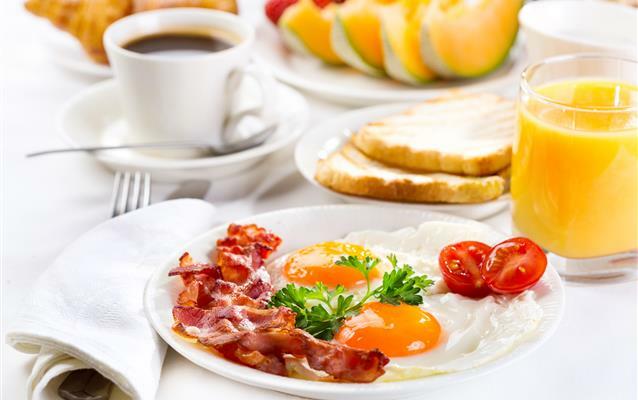 In different hotels around the world you can find various kinds of breakfast. It's worth checking the breakfast offer during the booking process. We present basic types of breakfasts in hotels. The breakfast usually consists of fried eggs, beans, mushrooms, small sausages and grilled tomato. Additionally, toast, coffee or tea and juice. The breakfast usually consists of two eggs, bacon, small sausages, pancake and maple sauce. Additionally, toast, coffee or tea and juice. Optional cereal with milk. The breakfast usually consists of toast, jam, coffee or tea and juice. In the extended version, you can also find hot dishes - scrambled eggs, sausages, milk soups. The breakfast usually consists of soft-boiled eggs in a glass, rolls, a plate of meat, jam or honey, and coffee with cream or tea, juice or water. In hotels you can also find buffets full of different types of products, such as hot dishes and fruits, which you can use to compose your own breakfast.